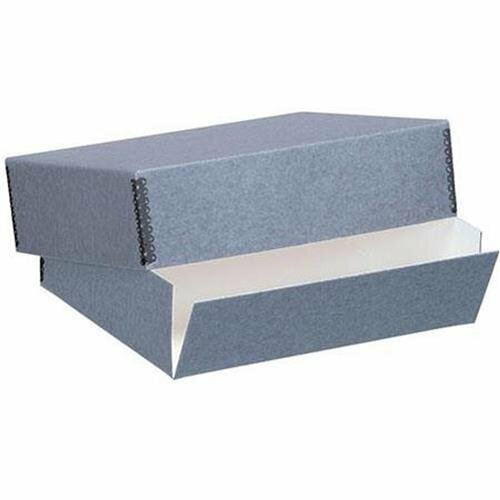 Measuring 23 by 31 by 3 inches this gray Lineco Museum Storage Box is ideal for protecting important documents, delicate papers, photographs and artwork. Featuring a drop front to conveniently retrieve valuables, each box is constructed with a buffered 60 point board that is reinforced with metal edges. Both acid and lignin-free, this archival storage box will protect against acid, airborne pollutants, light and dirt. Holds documents up to 9 by 12 inches. Lineco Archival 16" x 20" Print Storage Box, Drop Front Design, 16 1/2" x 20 1/2" x 3", Exterior Color: Blue / Gray.